The event ended almost 18 months of secrecy over Apple's television project and featured some of the biggest names in entertainment promoting their original content shows. Apple is working to reinvent itself as an entertainment and financial services company as sales of its iPhones fall. "We believe deeply in the power of creativity," Chief Executive Tim Cook told an audience at the company's Cupertino, California, headquarters. He said Apple's partners on the Apple TV+ service were "the most thoughtful, accomplished and award-winning group of creative visionaries who have ever come together in one place." Apple has commissioned more than 30 shows, including a science fiction show from Spielberg, a horror series from movie director M. Night Shyamalan, a new Sesame Workshop show teaching coding to kids and a drama set in the world of morning television starring Oscar winner Reese Witherspoon and popular former "Friends" star Jennifer Aniston. "This has brought me back to television, and I am really excited about it!" Aniston said on Monday. Winfrey, who ended her daily talk show in 2011 after 25 years to launch her OWN cable channel, said she would interview "artists, newsmakers and leaders," present two documentaries - one about harassment in the work place and another about mental health - and launch a new, bigger version of her popular Oprah book club. "My deepest hope is we all humans get to become the fullest version of ourselves as human beings, to join in that mission and unite for our common good and leave this world more enlightened, kinder and better than we found it," she said in a rousing speech. 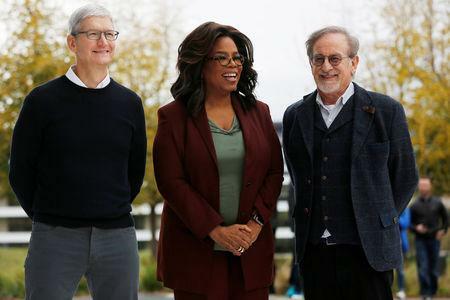 Winfrey said she had joined Apple because "they are the company that has re-imagined how we communicate." "They're in a billion pockets y'all. A billion pockets ... The whole world's got them in their hands and that represents a major opportunity to make a genuine impact," she said. Cook bade Winfrey farewell with thanks and a hug, wiping away a tear in his eye. "I will never forget this," he told her. Songstress Sara Bareilles performed an emotional new ballad that will serve as the theme song from her new musical drama "Little Voice," while Pakistani-American comedian Kumail Nanjiani performed a brief standup routine to introduce his "Little America" series about immigrants in America. "We hope 'Little America' will help viewers understand there is no such thing as the other. There is only us," Nanjiani said. "We are excited that we get to tell these stories with Apple. Connecting humanity is in their DNA," he added. A short compilation reel of clips ended with "Aquaman" star Momoa, who will appear in futuristic drama "See" about a world in which everyone has lost the power of sight. "This is where we build our new home," he said.